All Aboard | Fit Families | Kids VT - small people, big ideas! Lessons: $20 per person for group lesson; $30 per hour for private or semiprivate lesson. Tours: $25-45 per person. Family Thursdays: 2-3:30 p.m. weekly; $12 per parent/child pair. Group lessons: $50 per person. When I purchased an Oxbow stand-up paddleboard in 2009, I figured I'd just bought myself some freedom from my two tiny offspring. Stand-up paddleboarding — SUP for short — is similar to flatwater canoeing or kayaking, only you're not crouched in a boat. The surf-inspired sport was new to Vermont in '09, but paddleboarders have since become a common sight on Lake Champlain and other Green Mountain waterways. I SUP'ed solo for a while, reaping the physical benefits of a stronger core and upper body while enjoying this easy, quiet way to get out on the lake. But lately I've discovered that my kids, now 6 and 4, seem pretty game to try it for themselves. What's SUP with that? "It's the simplicity," says Jason Starr of Burlington's Paddlesurf Champlain. "Kids know intuitively what to do once they see and touch a paddleboard — standing on the board comes naturally." Still, there are some parameters for SUP'ing with kids. For starters, Burlington's Lake Champlain Community Sailing Center recommends that all paddlers be at least 8 years old. 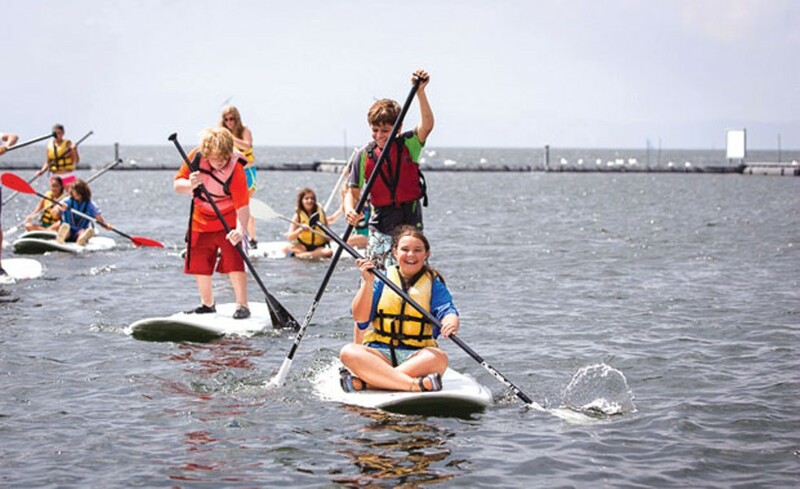 "At this age, kids have the coordination and mobility necessary to build paddling skills and really enjoy their time on the water," says Nick Neverisky, the center's education director. Starr starts 'em up at around the same age but bases it more on strength. "Can they paddle effectively to move the board forward, stop it and turn?" he asks. "Nine years old is a good rule of thumb. But you can safely start them as young as 3 riding with you." Those younger riders can sit or kneel at the front of a parent's board, trailing their fingers in the water and soaking up the scenery as the adult paddles. When both parties feel comfortable together, the child can practice standing. Once kids are ready to manage their own board, says Starr, parents can paddle alongside them, playing games to teach the rhythm of alternating sides with the oar, and practicing going straight, turning and stopping. "You can nudge their board with yours to fix their direction or be a buffer between their board and an obstacle," Starr says. In late June, Paddlesurf Champlain started teaching these skills at Family Thursdays, SUP sessions held at Burlington's Oakledge Park. The 90-minute afternoon lessons cater to parents and kids, whether they're paddling together or separately. At the Community Sailing Center, kids enrolled in the Lake Adventure Camps will learn the same basic skills. Families can also schedule private lessons. Both Starr and Neverisky remind parents that everyone should wear a personal flotation device or life vest, and to check conditions for wind, waves and weather. "At the beginning, don't go out when winds are more than 10 miles per hour," advises Starr. He also recommends clipping children's life vests to their boards with a towline, so they can't lose their boards if they fall off. What size board should you use? "Kids can ride boards as small as seven feet long, but they're also comfortable on boards [up to] the 11-foot range," says Starr. "Parents riding with their kids will want a board that is at least 31 inches wide and 11 feet long. The bigger the better." It'll be a couple more years before my kids are on their own boards. But I'm pretty ready to accept that SUP is no longer just "me" time, but "we" time, too.